The system of "national platforms" as envisaged under the Convention on the Manipulation of Sports Competition (referred to as the “Macolin Convention” or the “Convention”) is the cornerstone of the increasingly sophisticated legal framework in the transnational fight against manipulation of sports, which mainly concerns betting1-related match fixing. A brief introduction to the Macolin Convention and the concept of "national platforms"
The Macolin Convention is the only existing internationally binding legal framework which seeks to combat the manipulation of sports. According to Article 1 it has the dual purpose of, on the one hand, preventing, detecting and sanctioning sports manipulation nationally and internationally and, on the other hand, promoting cooperation between the various stakeholders involved in sports and sports betting. It thus creates positive obligations on States to concretely assist both public and private actors in tackling the multi-faceted problem of sports manipulation. This article will focus on the latter objective, the promotion of cooperation in the form of national platforms. As will be discussed below, national platforms serve as information hubs that collect, analyse and disseminate relevant intelligence and information as well as take on the role as coordinators of criminal and disciplinary investigations and proceedings related to sports manipulation (Article 13). They thus are not abstract forums but rather seek to bring each stakeholder to the table to effectively prevent, detect, investigate and sanction all forms of manipulation of any type of sports competition as defined in Article 3 of the Convention. It is at the national platform where the implementation of all of the Convention’s provisions culminate. The current momentum in the fight against the manipulation of sports competitions and the importance of cooperation at both the national and international level in this regard is illustrated by the recent arrest of 13 people, including players, as part of an investigation into match-fixing in the context of lower-level professional tennis by Belgian police. Belgian authorities, with the involvement of its national platform, cooperated with their Bulgarian, Dutch, French, German, Slovakian and US counterparts in what has been described as one of the largest law-enforcement operations ever staged against tennis corruption. In addition to the arrests, 21 properties were searched in Belgium with simultaneous raids taking place in other countries across Europe.2 These law enforcement operations come after the release of the Independent Review of Integrity in Tennis Interim Report3 in April which warned of the prevalence of betting-related corruption at the lower levels of professional tennis. The Convention is a cornerstone in such efforts against match-fixing and its system of national platforms is the crux in ensuring its success. In light of the global problem of match-fixing in sports, the Convention is open for signature not only to Council of Europe member States but all countries worldwide. Nevertheless, it has not reached the requisite number of ratifications, namely at least five (including three member States of the Council of Europe). To date, it has been signed by 32 States4 but ratified by only three (Norway, Portugal and Ukraine). A major stumbling block in this regard is the EU’s reluctance to allow its members to ratify the Convention due to Malta’s opposition.5 With betting and other gambling activities forming the second largest economic sector after tourism, Malta specifically takes issue with the definition of the term “illegal sports betting” under the Convention.6 As of today, this opposition has created a significant, but not unsurmountable, obstacle to the Convention’s entry into force. Positive developments can be discerned from non-EU States such as Switzerland, where ratification of the Convention is currently scheduled for discussion before the Parliament and Federal Council.7 Other non-EU States are undergoing similar processes and may ratify the Convention within the next year. Sport enforcement actors are multiple: just to name a few, there are police forces and the prosecutor’s office, sports enforcement units - be it at the global sports level (such as the World Anti-Doping Agency) or for each individual sport (such as the Disciplinary and Integrity unit of the UEFA or the Tennis Integrity Unit) -, supervisory authorities within the betting industry as well as a number of ministries. They have different jurisdictions, roles and access to different intelligence and information. For various reasons, these actors are often not used to working together, sharing information or coordinating with each other. In particular, criminal enforcement agencies are usually prohibited by law from sharing information with third parties that are not formally participating in investigations and frequently consider themselves as having absolute primacy over other (particularly private) enforcement actors. As such, cooperation and exchange of sensitive data between these stakeholders is not always easy. The Convention acknowledges this problem and thus created the special concept of national platforms. On a related note, it is important to recognize that each enforcement actor has intelligence and information of its own which could be useful for other bodies involved in the fight against sports manipulation. For example, law enforcement agencies have access to criminal files and records; sport enforcement actors have intelligence and information on players as well as special knowledge about the specificities of the sport; and regulators of betting operators have obvious expertise in the betting industry, including an understanding of sophisticated data. Furthermore, each of these actors has its own information collection toolkits. Law enforcement can wire-tap phones or computers, make searches and arrests; sport authorities can oblige their affiliates to “spontaneously” provide their telecommunication and data storage devices and can hear witnesses in more informal conditions than law enforcement agencies; and supervisors of betting operators can monitor and analyse significant amounts of data. For obvious reasons, increased sharing of information, know-how and tools is in the best interest of the integrity of sport. cooperate with all relevant bodies and organisations at national and international levels, including the national platforms of other States. Thus, formats and institutional structures vary widely. This partly reflects the States’ differing conceptions of the national platforms’ proper position within the existing framework of sports integrity preservation as well as the domestic situation and challenges faced. The freedom left to States is one of the key advantages of the Convention’s cooperative framework. It acknowledges that existing national mechanisms and structures need to be respected and that there is no “one size fits all” approach. It further increases States’ willingness to set up their national platforms by making it a uniquely domestic body rather than forcing a predetermined model upon all States parties without leaving room for national divergences. It may seem obvious at first, but it has proven most successful to let public authorities, such as law enforcement agencies or Ministries, head the national platforms. This structure facilitates a number of processes, including obtaining authorisation for implementing measures in line with the Convention’s provisions; gathering and handling sensitive data and conducting investigations; as well as imposing serious coercive measures at the end of an enquiry if required, such as prison sentences, confiscation orders, forfeiture of assets, etc. Placing the lead of platforms in the hands of such public authorities also counters several problems that we will describe below. Norway’s and Finland’s national platform currently follow this type of format, being run out of the Ministry of Sports with a coordinator placed within the national gaming authority (Norway) and an independent entity, FINCIS (Finland). Such a structure ensures that the representatives’ roles are clearly defined, including by isolating final decision-making authority within a single lead representative. However, this also will require the stakeholder in charge to have a broad understanding across all sectors involving sports manipulation and thus, beyond its experience within the respective public body (such as data protection laws, criminal law, betting regulations or any other sports manipulation related matter). A large part of the existing national platforms (around 18-20) are still in their development or the informal stages. The final step in the establishment process is to send a formal communication to the Secretary-General of the Council of Europe. To date, few have done so. However, as stated above, there is a momentum among States to work in that direction, often with the help of the Council of Europe. Most notably the KCOOS+9 project of the Council of Europe together with partners, including States and organisations, provides extensive support to States in implementing the Convention and fostering compliance therewith. This includes assisting beneficiary countries with setting-up national platforms and facilitating the sharing of best practices. KCOOS in its first phase (2016-2017) involved 32 countries in regional seminars, study visits as well as expert missions to select countries, including, for instance, to Cyprus in order to offer technical expertise to the main stakeholders and provided extensive assistance to Belgium in the set-up of its national platform. 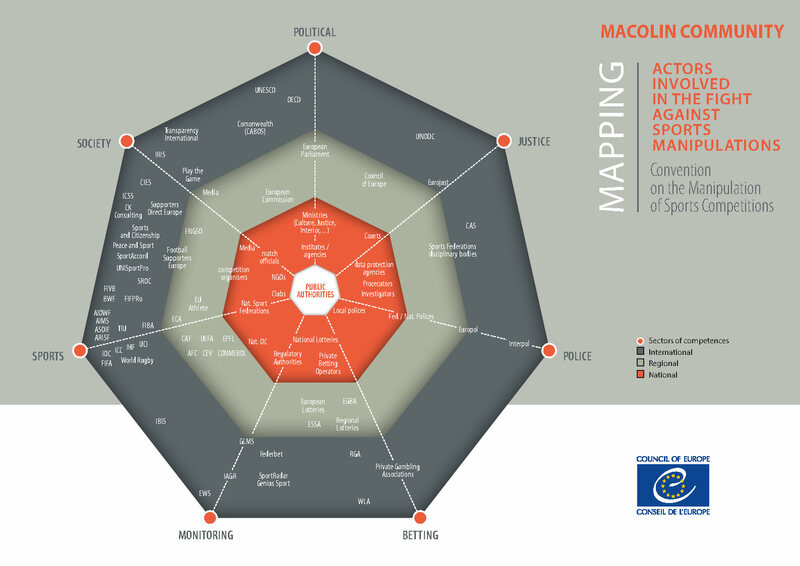 Once up and running, one of the key factors for the success of a platform lies in ensuring access of all necessary actors, ranging from law enforcement agencies and prosecutors to betting operators and sports movements.10 The below image of stakeholders illustrates the wide range of actors involved in and instrumental to effective action against sports integrity offences. Council of Europe, Mapping of Actors Involved. In July 2016, the Secretariat of the Council of Europe established the “Network of National Platforms”, referred to as the Group of Copenhagen, with a view to promoting the cooperation objective within the Convention. 19 national platforms (partly fully set-up, partly still undergoing the establishment process) have so far joined this informal network for the primary purpose of exchanging information, experience and expertise in the implementation of the Convention’s standards.11 Such cooperation further extends to providing mutual legal assistance as well as pooling resources for investigations and other initiatives to fight sports manipulation. However, currently, the Group of Copenhagen’s work is entirely based on the goodwill of the participating representatives rather than any binding legal obligation. This raises a certain number of difficulties, which will be discussed in the following section. An Informal Application of the Macolin Convention: What Obstacles Remain? Although the theory of the Convention is widely praised, its potential has not been fully realised in practice. Like the national platforms themselves, its reach, and thus success, strongly depend on the Convention’s entry into force and the number of States becoming parties thereto. In particular, it remains to be seen whether Malta can continue to block the Convention’s ratification by all EU countries. Until then, numerous concerns remain. Firstly, a fully functioning system of both national and transnational cooperation in the fight against sports manipulation depends on the admissibility, recognition and enforceability of decisions or actions taken within the Convention’s legal framework. The national platforms’ actors need to be able to rely on and invoke legally binding provisions. For instance, public authorities are currently reluctant to share evidence within national platforms in the absence of a formal framework to do so. This necessarily has an impact on the functioning of national platforms, which could be more effective if they received a greater amount of information from other national platforms. In concrete terms, national platforms cannot realise their full potential without a significant number of State parties to the Convention. Secondly, and as a consequence of the former, existing cooperation across the spectrum at both the national and international levels remains largely informal and based on the ad hoc mutual trust of the individuals involved in the fight against the manipulation of sports. However, State actors naturally cannot rely solely on an informal network of trust between certain individuals, but rather, must be able to resort to formally established institutions within a solid legal framework. The Convention’s entry into force would create such a common legal system governing issues such as the sharing of sensitive data and mutual legal assistance, thereby enabling the requisite cooperation from a formality standpoint. Thirdly, the ratification of the Convention would eliminate the common misconception that national platforms exist only to monitor betting. Instead, they are created to ensure a coordinated effort with regard to all types of manipulation in relation to all forms of sports competition (as defined in the Convention) as well as to prevention, detection, investigation, securitisation and sanctioning activities. Fourthly, and again related to the lack of enforceability of the Convention transnationally, one of the major practical concerns that stands in the way of effective information-sharing - both nationally and internationally - is the protection of personal data. A particular risk in this context is that data could be used beyond the intended purpose or retained longer than necessary for such purposes.13 The Convention attempts to address this by i) making data protection a guiding principle (Article 2); and ii) directly providing that States parties shall adopt legislation to ensure personal data is duly protected (Article 14). The Convention’s lack of enforceability has, unfortunately, already shown first signs of a negative impact in practice. Portugal, for example, has signalled its reluctance to share sensitive information in light of the limited number of ratifications to date. The entry into force of the Convention would thus give the States parties the necessary guarantee that, when implementing the Convention’s provisions and sharing sensitive data, they have a direct fall back in case of non-compliance with data-protection principles by another State party. Lastly, confidentiality issues often prevent law enforcement agencies from sharing information gathered in the course of national and international criminal investigations with sports movements or other (especially private) stakeholders, while for the sake of efficiency and to avoid duplication, open communication between these bodies would be essential, there are “significant limits to the cooperation that actually takes place”.14 As an added obstacle, law enforcement officers sometimes perceive investigations carried out by sports governing bodies as biased or as counter-productive to ongoing police investigations. This in turn results in a reluctance or, in the worst case, complete unwillingness to share sensitive information.15 Such concerns could be resolved by ratifying the Convention and adopting national legislation, coupled with confidence-building measures between the actors involved. National platforms could also play a key role in facilitating such initiatives. The 3rd Strasbourg Conference on the implementation of the Convention, to be held in September 2018, has rightly identified national platforms as “the key component for responding to the remaining challenges related to the fight against the manipulation of sports competitions” and will thus focus on the pending problems faced by national platforms.16 Indeed, as acknowledged by the Convention itself, sports manipulation is a global phenomenon which requires a global response. Therefore, cooperation is key. The existing national platforms have proven their value in facilitating such cooperation and provided the stakeholders with a channel to communicate. The full implementation of the Convention could very well be a “milestone”17 and is one-of-a-kind in the context of the protection of sports integrity. 5While from a strictly legal standpoint Malta’s consent may not be necessary - depending on whether ratification of the Convention falls within Art. 3 (Exclusive Competences of the EU) or Art. 4 (Shared Competences of the EU) - the EU is retaining its policy that unanimous approval of all EU members is required. 7See « Convention de Macolin : le Conseil fédéral renforce son action contre la manipulation de compétitions sportives », available at https://www.baspo.admin.ch/fr/home.detail.news.html/baspo-internet/2018/magglinger-konvention-bundesrat-verstaerkt-kampf-gegen-manipulation-bei-sportwetten.html.html. 11Network of National Platforms (Group of Copenhagen), Explanatory Note, 14 March 2017, para. 3. 13Explanatory Note, Macolin Convention, para. 127. 14Id., p. 35, para. 153. 16Council of Europe, Sport (Democracy), Conventions, available at https://www.coe.int/en/web/sport/manipulation-of-sports-competitions. Marc Henzelin is a partner at LALIVE. He has vast experience in transnational and domestic litigation, in particular in international and economic criminal law, commercial and banking litigation, asset recovery, mutual legal assistance in criminal matters and extradition. In addition, he has significant experience in sports law and public international law. He regularly leads investigations and recently undertook an extensive cross border investigation into corrupt practices in sport as part of his role in the Independent Review Panel of Tennis. Giulio Palermo is a partner at Archipel. He is admitted to the Bars of Rome, Madrid and Geneva and specialises in international arbitration both as counsel and arbitrator. He also advises sporting federations on recasting their settlement mechanisms and rules on integrity and he practices cross-border litigation with a special focus on court proceedings related to arbitration. Teresa Mayr is a trainee lawyer in the international arbitration practice group at LALIVE. She has previously worked at the International Court of Justice in The Hague as well as at the United Nations in New York and Geneva. She is admitted to the New York State Bar. She holds a BA in Law from Cambridge University and an LL.M. in Advanced Studies in Public International Law from Leiden University.